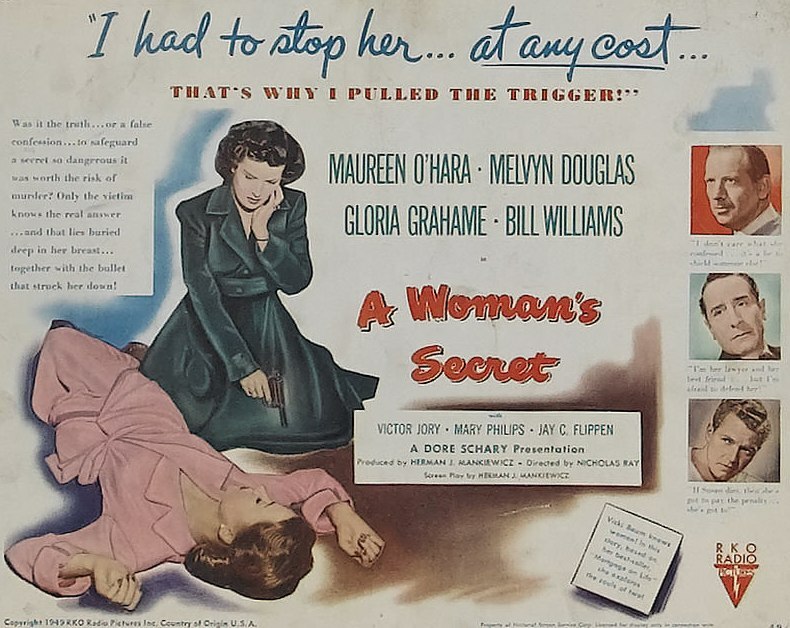 A Woman’s Secret is the third Nicholas Ray film I’ve reviewed on this blog, but it was the second film he directed. Ray completed his first film, They Live by Night, in 1947, but RKO wasn’t sure how to market it. 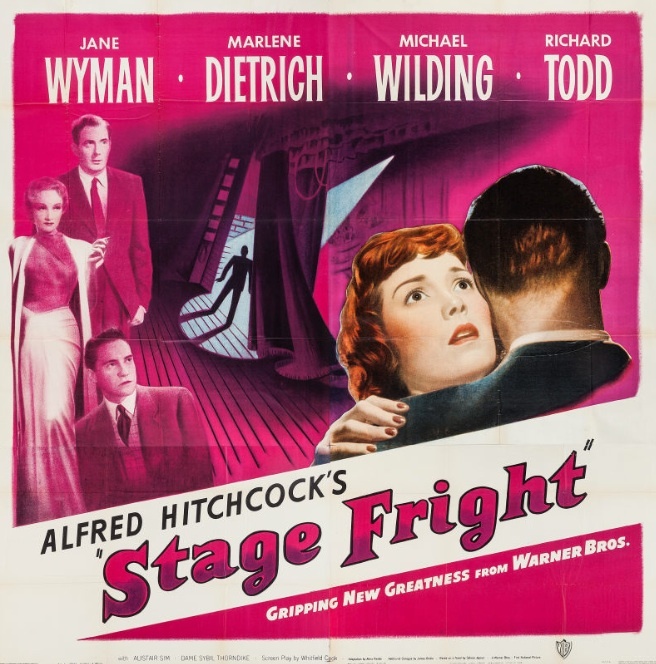 It premiered in the United Kingdom in a single theater on August 5, 1948. The success of Ray’s third film, Knock on Any Door (1949), led to his first two films being released in the United States in 1949 by a newly confident RKO Radio Pictures. Of his first three pictures, A Woman’s Secret is easily the weakest, and is significant mostly because it’s how Ray met his second wife, actress Gloria Grahame. After shooting wrapped, the two were married in Las Vegas on June 1, 1948. It was the second marriage for both of them. (They had to live in Nevada for the required six weeks before Grahame could get her quickie divorce from actor Stanley Clements). Before they divorced in 1952, Grahame starred in one of Ray’s greatest films, In a Lonely Place (1950), which also starred Humphrey Bogart. A Woman’s Secret was a contract job for Ray. The screenplay was adapted from Austrian writer Vicki Baum’s 1946 novel Verpfändetes Leben (Mortgage on Life) by the film’s producer, Herman J. Mankiewicz. Ray had no script input, so it’s easy to write it off as a studio-imposed footnote in Ray’s career. A Woman’s Secret is a “women’s picture” wrapped in a mystery. It’s no In a Lonely Place, but it’s worth watching at least once. 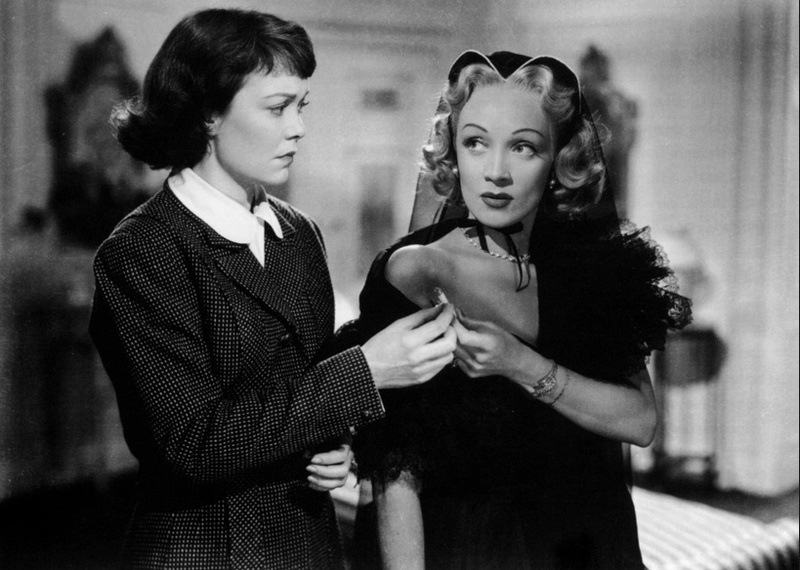 The central relationship in the film is the one between Marian Washburn (Maureen O’Hara) and her protégé, Susan Caldwell (Gloria Grahame). Marian is a singer who has lost her voice, and she’s completely shaped and guided Susan’s career, rechristening her “Estrellita.” One night, after the two argue bitterly, a shot rings out. Susan lies on the floor near death, a bullet lodged near her heart. Marian is holding the smoking gun, but this is a mystery picture, so don’t assume anything yet. Most of the film’s plot unspools as a series of flashbacks as Susan lies in the hospital and the detective assigned to the case — Inspector Fowler (Jay C. Flippen) — tries to piece together the facts. He spends a good deal of time with composer and pianist Luke Jordan (Melvyn Douglas), who is Marian’s boyfriend. Fowler also gets plenty of help from his wife, Mrs. Fowler (Mary Philips), who’s running an investigation of her own. There are a lot of interesting things going on in A Woman’s Secret, but nothing really jells. The film is too crowded with plot and characters for the central relationship between Marian and Susan to ever be fully explored. 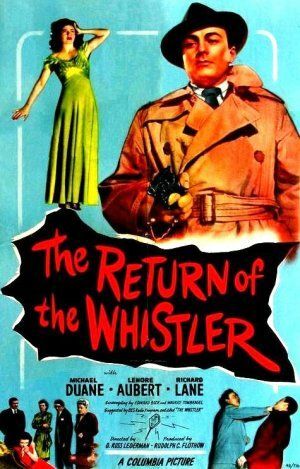 Melvyn Douglas and Jay C. Flippen are fine performers, and both inject their two-dimensional characters with enough life to make their scenes interesting. Philips gets a juicy role as Inspector Fowler’s wife, and her nosiness isn’t just played for laughs. She actually knows what she’s doing, much to her husband’s chagrin. Most people who write about Ray’s career either gloss over or completely ignore this film. There’s not much about it that fits in with his obsessions and themes. But despite a studio-imposed script, there are interesting themes and tensions bubbling below the surface. Grahame’s role as Susan/Estrellita in particular feels at home in Ray’s oeuvre. She’s a misunderstood, inarticulate, unhappy, and tragic outsider — a character type that would recur again and again in Ray’s films. Posted in 1949, March 1949 and tagged Gloria Grahame, Jay C. Flippen, Mary Philips, Maureen O'Hara, Melvyn Douglas, Mystery, Nicholas Ray, RKO Radio Pictures. Bookmark the permalink. Sleep, My Love is a slick, classy thriller from the slickest, classiest director of all time, Douglas Sirk. 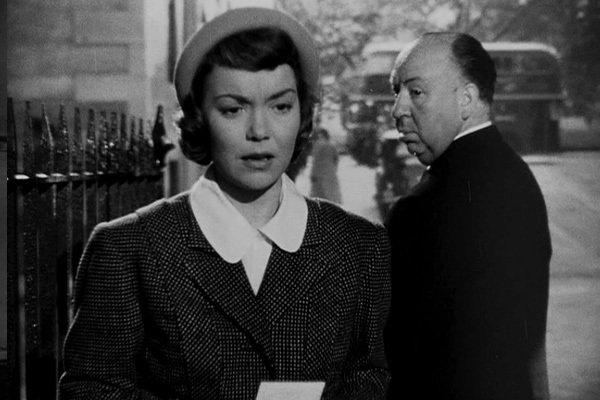 Granted, his greatest work was a few years ahead of him, but even when he was making run-of-the-mill potboilers like Sleep, My Love and Lured (1947), Sirk applied not only his considerable skill as a filmmaker to the material, but also his fetishistic attention to details, and his love of the sumptuous and the glamorous. The film starts with a bang. Alison Courtland (Claudette Colbert) wakes up from a nightmare on a train, screaming. She doesn’t have any memory of how she got there. The last thing she remembers is going to sleep next to her husband in their palatial home on Sutton Place and East 57th Street. Oh, and there’s a small pistol in her bag that she doesn’t remember having, either. 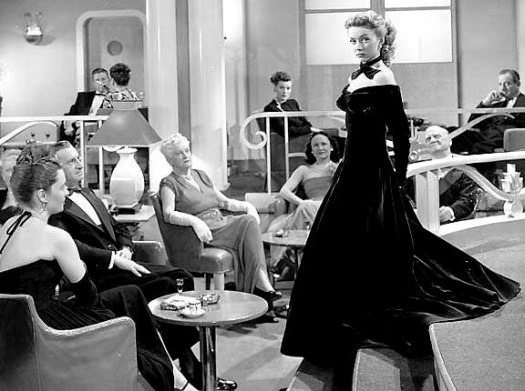 Sirk introduces all the players in his mystery early in the film — Alison’s husband, Richard Courtland (Don Ameche), her friend Barby (Rita Johnson), Barby’s brother Bruce (Robert Cummings), Detective Sgt. Strake (Raymond Burr), a mysterious man with horn-rimmed glasses named Charles Vernay (George Coulouris), and the leggy, beautiful Daphne (Hazel Brooks) — but it’s not immediately clear how they all relate to one another. Much of the pleasure in watching Sleep, My Love comes from seeing how Sirk moves all of his chess pieces around the board. It’s clear from the outset that someone is gaslighting Alison, but who is doing it? And why are they doing it? This isn’t the kind of mystery in which the solution comes as a complete surprise and is explained by a brilliant detective who gathers all the suspects together in a drawing room; rather, it evolves and reveals itself naturally over the course of the film. It won’t take an astute viewer long to figure out what’s going on, but Sirk isn’t trying to pull the wool over anyone’s eyes. He’s simply making a thrilling film that’s beautiful to look at, and succeeding with aplomb. Posted in 1948, February 1948 and tagged Claudette Colbert, Don Ameche, Douglas Sirk, Film Noir, George Coulouris, Hazel Brooks, Mystery, Raymond Burr, Rita Johnson, Robert Cummings, United Artists. Bookmark the permalink. Are there any fans of the old ABC TV series 77 Sunset Strip (1958-1964) out there? If you have fond memories of that hepper than hep private eye show, you might be interested to know that this little mystery programmer is where it all started. 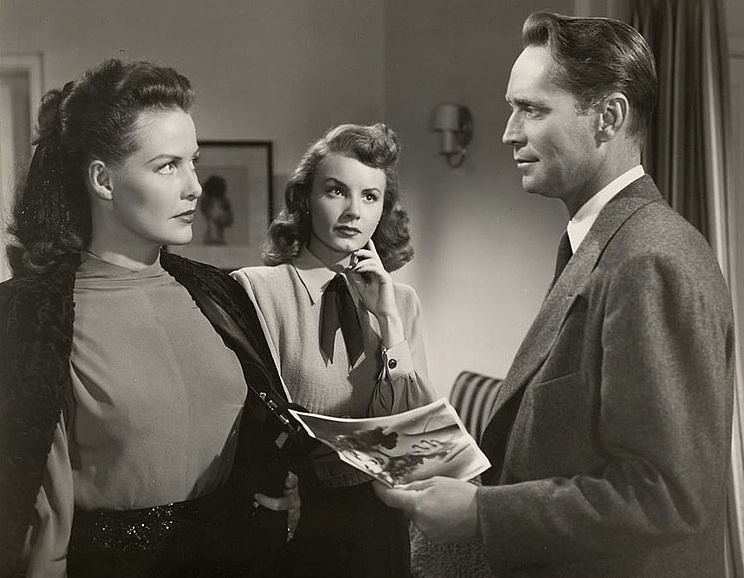 S. Sylvan Simon’s I Love Trouble is based on Roy Huggins’s novel The Double Take, and stars Franchot Tone as Stuart Bailey, a pencil-necked P.I. with a high forehead and an eye for the ladies. Bailey was later (and more famously) played by Efrem Zimbalist Jr. — first in “Anything for Money,” an episode of the ABC series Conflict (1956-1957), and then in the ongoing series 77 Sunset Strip, where he was paired with a partner, Jeff Spencer (Roger Smith). I haven’t read any novels by Roy Huggins, but if I Love Trouble is any indication, he was a writer firmly in the mold of Dashiell Hammett and Raymond Chandler. 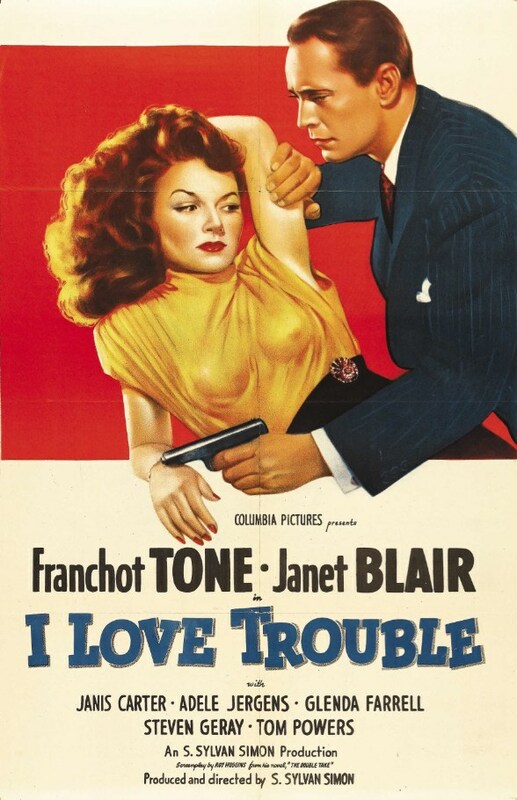 With a title like I Love Trouble, I was expecting a lighthearted mystery-comedy, so I was pleasantly surprised when it turned out to be a hard-boiled mystery with crisp dialogue and a well-rendered Los Angeles backdrop. Although he suspects there’s more to the story than Johnston is telling him, Bailey heads for Portland, Jane’s hometown, where he finds out that a high school diploma wasn’t the only piece of paper she picked up. She also got a work permit to dance at “Keller’s Carousel,” a seedy little club on South Broadway. 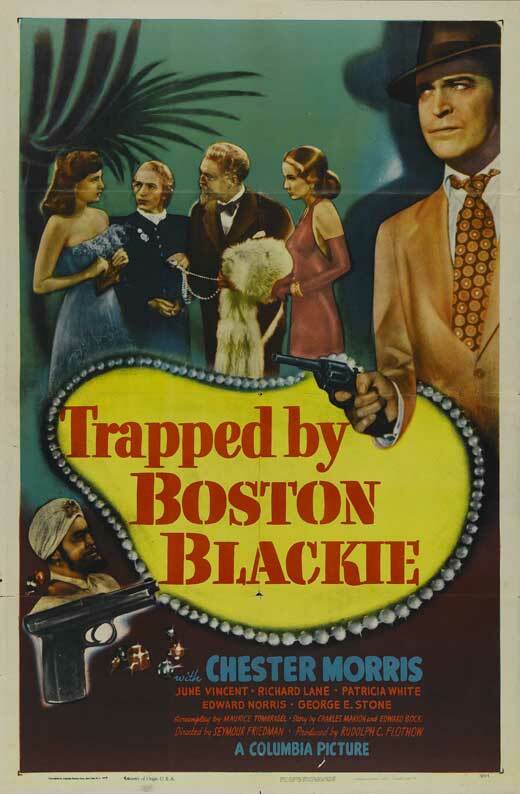 Keller (Steven Geray) and his henchman Reno (John Ireland) don’t take kindly to snoopers, and they send Bailey home with a few black-and-blue souvenirs. Back in Los Angeles, Bailey is approached by a woman named Norma Shannon (Janet Blair), who claims to be Jane’s sister from Portland. But she doesn’t recognize the theatrical head shot of Jane sitting in Bailey’s apartment. What’s going on? I Love Trouble is a solid B movie from Columbia Pictures. It’s chock-full of beautiful actresses (Adele Jergens doesn’t even rate a mention in my plot summary, but I sure was happy to see her in a swimsuit). It’s sometimes hard to distinguish one from another, but if you’re paying attention (and have ever read Chandler’s Lady in the Lake), you’ll realize why that actually works in the film’s favor. As played by Tone, Stuart Bailey isn’t a very memorable character. Tone is simply too gangly and effete to be fully believable as a hard-boiled P.I, but the story is good, the dialogue is hard-boiled, and the action is tough and fast-paced. I especially enjoyed Bailey’s wisecracking secretary, Hazel “Bix” Bixby (Glenda Farrell). Posted in 1948, January 1948 and tagged Adele Jergens, Columbia Pictures, Franchot Tone, Glenda Farrell, Janet Blair, Janis Carter, Mystery, S. Sylvan Simon. Bookmark the permalink. William Castle’s 66-minute mystery The Crime Doctor’s Gamble was the ninth film in the series of programmers from Columbia Pictures. 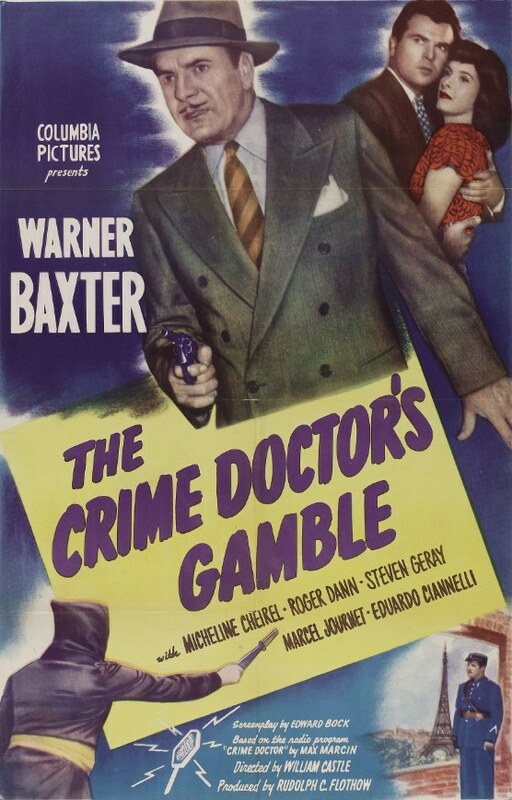 Based on Max Marcin’s radio series Crime Doctor (1940-1947), the films starred Warner Baxter as Dr. Robert Ordway, a former amnesiac and reformed criminal who now works as a psychiatrist and solves mysteries in his spare time. Every entry had a little something special to distinguish it from all the other entries. The gimmick of The Crime Doctor’s Gamble is that it takes place in Paris, which is a step up from the hillbilly setting of the last entry in the series, The Millerson Case (1947), which was my least favorite of the Crime Doctor features so far. The Crime Doctor’s Gamble opens at the Institution Psycho-Pathologique des Invalides Mentaux, where Dr. Ordway is lecturing on crime deduction, modern psychiatry, criminal tendencies, and crime prevention to a roomful of old white-haired gents. Dr. Ordway is in Paris for two weeks, and has three lectures to give. He’s also visiting his old friend Inspector Jacques Morrell (Marcel Journet), but he doesn’t intend to become involved with any police matters during his time in Paris. Good luck with that plan, Crime Doctor. After a champagne-soaked night on the town, Inspector Morrell and Dr. Ordway go to a little hole in the wall club with a rooster on the door, where they watch a couple of very acrobatic dancers — a man and a woman whose act includes such spectacles as the woman being swung around by her hair. The dancers are followed on stage by a man dressed all in black who wears an executioner’s hood and throws knives at a woman wearing a white porcelain mask. Inspector Morrell muses how ease it would be for a trained knife thrower to commit murder and Dr. Ordway asks him if they’re on a busman’s holiday. Morrell denies it, but the next morning, back at the Préfecture de Police, Morrell invites Dr. Ordway to talk with murder suspect Henri Jardin (Roger Dann), whose father threatened to cut him out of his will after his marriage to Mignon Duval (Micheline Cheirel), the daughter of the knife thrower they saw the night before. Jardin remembers going into a rage the night his father was stabbed to death, but doesn’t remember what happened after their argument. Morrell has a personal interest in Henri. The two men spent time together in a concentration camp during the war. After the war, Henri spent six months in a psychoneurotic institution, but Morrell doubts his guilt. The mystery in The Crime Doctor’s Gamble is well paced and fairly involving. There’s a good collection of suspects — the Jardins’ butler, Theodore (Jean del Val), who overheard an argument the night of the murder, but thought nothing of it; the Jardins’ attorney, Jules Daudet (Steven Geray) who has never practiced criminal law, but who feels it is his duty to defend Henri for his father’s murder; Anton Geroux (Maurice Marsac), an expert painter of reproductions, or forgeries, depending on who’s doing the buying; the knife thrower, Maurice Duval (Eduardo Ciannelli), who says nothing good would have come of his daughter’s marriage to Jardin, and then says that even though Jardin was stabbed, that’s not how a knife thrower would kill with a knife, and drives his point home by throwing a knife into the door next to Ordway’s head; and, of course, Mignon and Henri … could one of them be guilty? Despite its soupçon of Parisian flavor, The Crime Doctor’s Gamble is obviously all filmed on the Columbia sound stages. The signs in the film are in French, but all the actors speak English, even when they are not speaking to Dr. Ordway. If you can overlook the cheapness of the production, however, The Crime Doctor’s Gamble is a good mystery. It’s also the type of series programmer that was on the verge of extinction with the coming popularity of television. Posted in 1947, November 1947 and tagged Columbia Pictures, Marcel Journet, Micheline Cheirel, Mystery, Roger Dann, The Crime Doctor, Warner Baxter, William Castle. Bookmark the permalink.